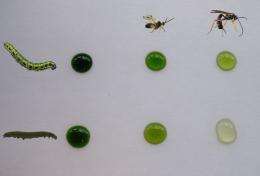 (PhysOrg.com) -- Parasitoid larvae that feed within caterpillars that eat cabbage plants influence the plant via the caterpillar, making the cabbage plant an unattractive prospect for moths looking for a spot to lay their eggs. Together with French colleagues, researchers from the Entomology Laboratory at Wageningen University, part of Wageningen UR, will be publishing their discovery this week in PNAS. Plants that are gnawed at by caterpillars produce blends of volatiles that attract parasitic wasps, parasitoids. These wasps lay eggs in the caterpillars, after which the parasitoid larvae devour their host. So rather than turning into butterflies, the caterpillars are actually helping to produce a new generation of wasps. So in fact, the parasitoids are rescuing the plants from their attackers. During their development, the parasitoid larvae influence the caterpillars they are developing in and in turn, the caterpillars influence the cabbage plant; and all with far-reaching consequences for the diamondback (or cabbage) moth. Cabbage plants eaten by cabbage white caterpillars are particularly attractive to female diamondback moths in search of a plant on which to lay their eggs. However, if the caterpillars have been colonized by parasitoids, the plants become less attractive to the diamondback moths. The level of impact depends on the species of parasitoid that is developing within the caterpillars. To find out exactly how the parasitic wasps alter the cabbage plants, the researchers monitored the activity of 9 genes that are activated when the caterpillars of the small and large cabbage white gnaw the cabbage plant. The researchers used caterpillars that were parasitized with one of three different species of parasitoids. The plants appear to respond differently to two types of caterpillars, but the actual species of parasitoid that is developing within the caterpillar makes a much bigger difference. It is the saliva of the caterpillars that affects the plants response. Interestingly enough, each individual species of parasitoid has a different effect on the quality of the caterpillars saliva, which is reflected in the colour of the saliva. More information: Parasitoid-specific induction of plant responses to parasitized herbivores affects colonization by subsequent herbivores. Erik H. Poelman, Si-Jun Zheng, Zhao Zhang, Nanda M. Heemskerk, Anne-Marie Cortesero, Marcel Dicke, Proceedings of the National Academy of Sciences (PNAS).